Info "We're a-Wario! We're gonna win!" Wario Swarm is a downloadable microgame in WarioWare: D.I.Y. and WarioWare: D.I.Y. Showcase. It was released on June 17, 2009 in Japan, May 17, 2010 in North America, and June 18, 2010 in Europe. 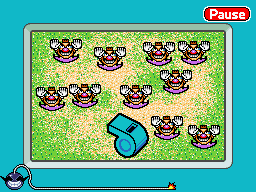 The player needs to blow a whistle to bring the many Tiny Warios on the screen together in a hexagonal formation to win the game. The whistle must be tapped five times. When the Tiny Warios come together, they transform into regular Wario. If this has not happened by the end, the game will be lost. This page was last edited on October 8, 2018, at 23:57.